A couple of years ago, I re purposed this candle chandelier into a succulent chandelier. I really liked it but I'm too cheap to keep buying new succulents every year so I took it down. 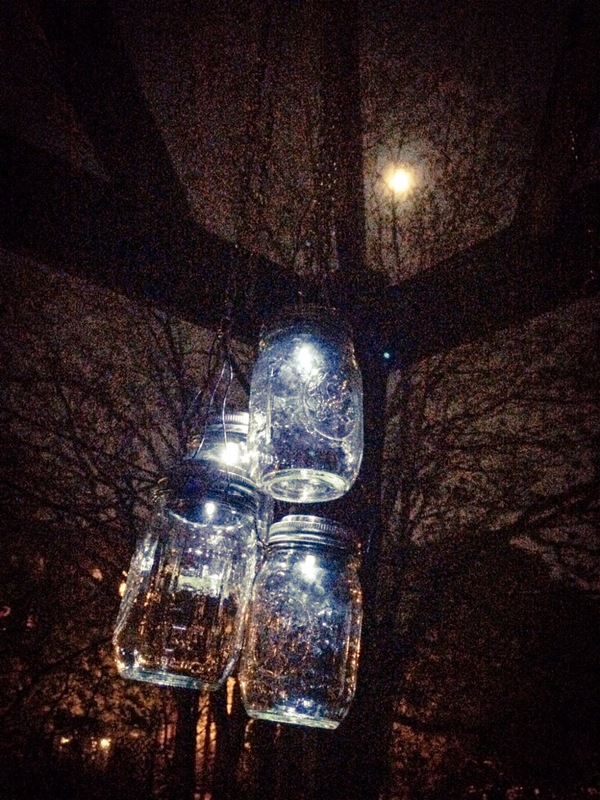 While I was out there working on another project, I thought I'd throw together a quick outdoor mason jar chandelier. 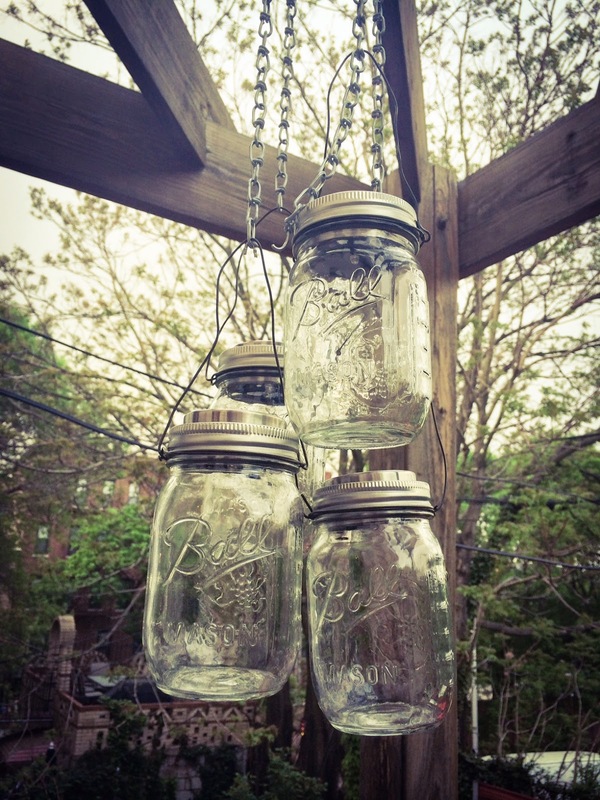 Mason jars, a length of chain and some solar caps - what could be easier? It was certainly a quick project but I'm not sure I love it. Close up it's cute enough and I enjoy the firefly in a jar effect at night but when you step back it's skimpy and gets lost. 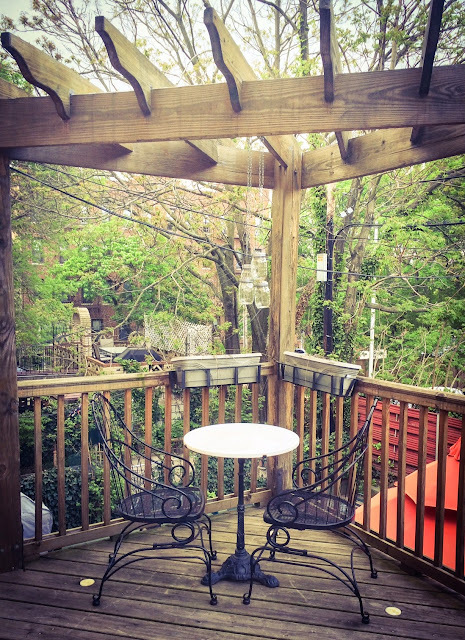 Granted, the whole area needs some TLC in the form of better planters, greenery/flowers and accessories so please excuse the bare factor - but I don't think this will do. As you know, I'm a sucker for over sized light fixtures and this doesn't fit the bill. I'm not sure if the problem would be corrected by adding more jars or should I scrap the whole idea and put up something different. I would definitely try more jars first. Especially since it seems so easy to do? But wait. Solar caps? Tell me more! If you do a google search, you'll see there are a few different sellers out there. I found these on ebay but they have only been up a few days so I can't tell you if they are reliable or not just yet. I'll let you know how they work after a few months if you are curious. Maybe a couple sturdy wire hoops in different sizes 'stacked' with different lengths of chain with more jars added to make more of a traditional chandelier shape? I'd add a couple of groupings of jars around the area. It will give you more impact and fill your ceiling space as well. I also like the idea of the wire hoops. So many possibilities! Both cool but require hard wiring (or frequent battery replacements). I need something that doesn't require either. Could you just get some of those battery operated tea lights/candles and go back to using the chandelier? I'd think you could saw/file the original candle holders down and put tea lights in the cup. Hardwiring or batteries won't work for me. It doesn't have to have lights at all but if it does, they have to work on solar power. I was hoping solar would be a little farther along but its still a pretty weak light. Okay, I see. Do you suppose there's anyway to adapt those solar powered lights they sell for people to line their walkways into some sort of lantern? Or even just hung individually at different lengths? Our Wal-Mart has many different styles, including globes, which might look cool if you could hang them. Yep, I'm usually an odd number collection person. I originally hung 5 but four looked better...but still not enough to make an impact. I'll have to try adding more/spacing them out. I believe you need another design option. Love the odd number configuration and the mason jars but it seems sparse. Perhaps if more jars were added plus spread out on varying lengths. Do a search on solar chandelier for more ideas. These are more substantial & you could repurpose your succulent chandelier into this.